I mentioned in this week’s Reading Challenge post how I am struggling to get my blogging ducks in a row. Heck, turned around today and realized those ducks weren’t even behind me! No wonder I can’t get ’em in a row. Ha! Today’s post is a perfect example. 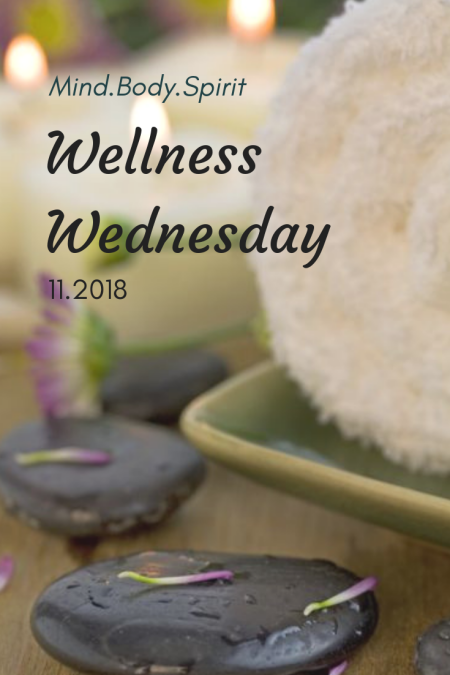 Wellness Wednesday…on Thursday, and late Thursday afternoon at that. I need to do better. And maybe with 2019, I will. Or not. Here are my goals for this year. Quite the comprehensive list, don’t you think? I’m nothing if not thorough! And my update for the month. Exercise – 4.5 had been holding steady at a 5.0 but we slipped a bit the end of October and now in November. Wore gym clothes to work today to make SURE we go when PC gets home. Diet – 4.0 was 4.5 but I have been eating more sugar and carbs than I should. With the holidays coming I am not sure how much better things will be. I am at least aware that I am shoveling sweets and breads into my mouth!! Staying Well – Maintaining a 4.5 Could do better breast exams and skin exams. Mental Wellness – Perfect score, 5.0 Continuing to write and read. My summer-turned-fall virtual book club has begun our 6th book just this week, The Tattooist of Auschwitz by Heather Morris. Come read with us!! Just started a new jigsaw puzzle. Spiritual Wellness – Maintaining a 5.0 Getting up every week day morning to ENJOY my quiet time. Continuing to write my Morning Pages and memoirs (sounds so literary of me) as suggested by Julia Cameron in her book It’s Never Too Late to Begin Again. Relationship Wellness – Up to a 5.0, finally! Our trip to Phoenix was not exactly relaxing because PC had to play double headers everyday, sometimes with less than an hour in between. The whole trip was kind of rushed. But we have enjoyed some of the activities on my autumn bucket list since we have returned home. And some nice soaks in our hot tub with a fire in the chiminea going. Determined to rate all 5s by year’s end. I think the exercise and diet are actually the easiest to control and improve on. Hope you will return on 12.12.2018 for our finally wellness post of the year. This month, we are all sharing tips for managing stress. Not sure that is entirely possible because I am doing most of these things and still grinding my teeth, chewing my cuticles on a regular basis, and enjoying some good ole emotional eating, too! Rather than just sharing what I do to try to manage stress, decided to share what WebMD says we should do. Which are almost one and the same but it sounds so much better coming from WebMD than from me. 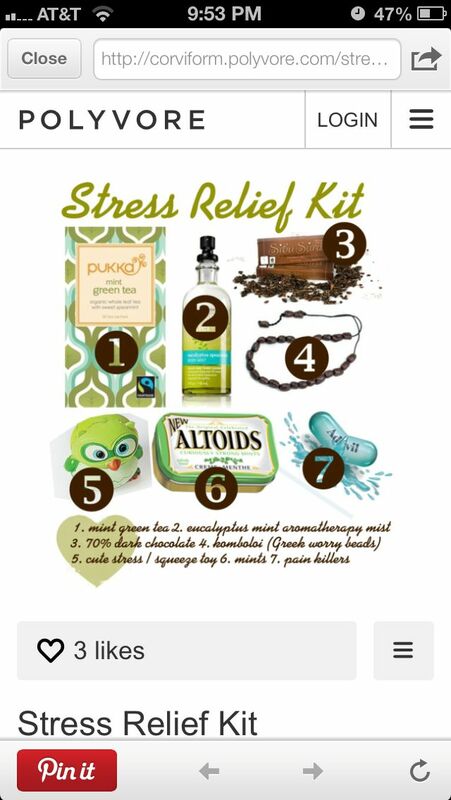 I discovered these “10 Tips to Manage Stress,” originally shared on WebMD. More authoritative coming from them. The tips are in bold face and my activities follow each tip. Exercise – My gym workouts. A minimum of 3o minutes 3-5 times a week. In addition, ideally, at least 75 minutes of vigorous exercise a week. Relax Your Muscles – Hot tub soak and stretching at the gym each visit. Scheduling an occasional massage or using hydro-massage bed at Planet Fitness. Sleeping well (melatonin, my friends). And we just bought two Zyllion Shiatsu back and neck heated kneading massagers, which are heavenly. Deep Breathing – Meditation. Not always a full blown meditation session but taking a few deep breaths to help take the edge off a stressful situation. Aromatherapy, too! Eat Well – Limiting sweets and alcohol. Need to do better at this. We don’t eat nearly enough green veggies or fruit. Slow Down – Setting my watch/clocks ahead by 5-10 minutes, something I have always done. Breaking down big jobs into little ones. When I realize that there aren’t enough items checked off my to-do list, I try to break them down into what has to happen this minute, today, this week. Takes some of the pressure off. Take a Break – Spending time listening to music, praying or enjoying nature. We need a little sunshine everyday. Make Time for Hobbies – For me this is reading, working jigsaw puzzles, crafting, scrapbooking. Talk about Your Problems – My go-to person for talking things out is my sister. She is the best listener and is enough removed from things to be more objective than my Prince, or my girls. Go Easy on Yourself – Remember that life throws us curve balls sometimes. But I hate when someone reminds me ‘that’s just life’. Even though it’s true. It is less stressful when we can find a way to laugh things off or at least just shake our heads and go on. Not always easy for me to do but I am better at it than I used to be. Although, my life is also easier than it used to be. Eliminate Your Triggers – If only!! But some of my triggers are self-inflicted. Like buying too many clothes and then being broke two days after payday. Yeah, not good. 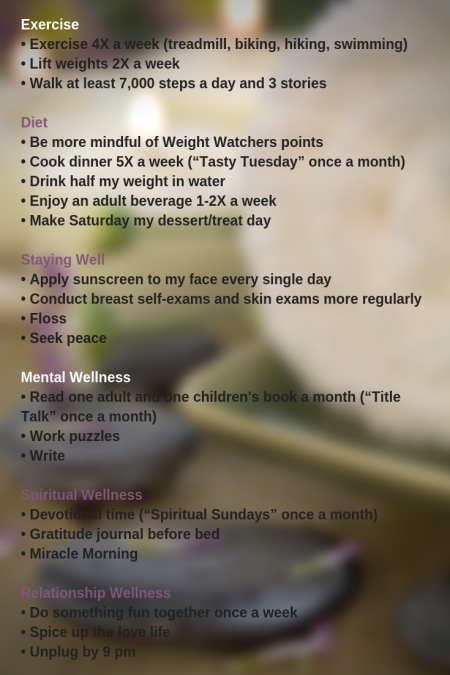 How would you rate your wellness in each of my categories…exercise, diet, staying well, mental wellness, spiritual wellness, relationship wellness? What do you to try to manage stress? Or maybe you have a stress-free life? Won’t you share in a comment below? If you have a wellness related post, won’t you link up with us? And then be sure to come back next month when we summarize our progress toward a year’s worth of wellness. 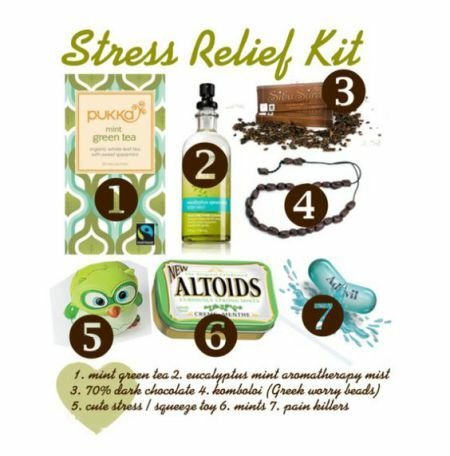 Came across some cute ideas for stress relief kits on Pinterest and saved them to my Health,Wellness, Beauty (and the Beast) board, here. 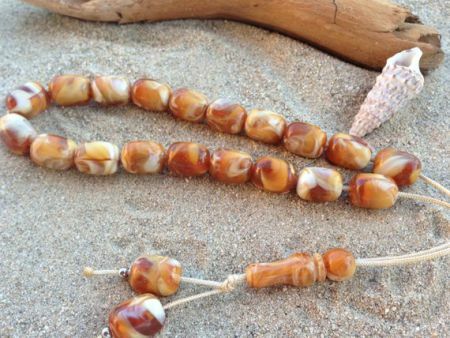 And check out these beautiful Greek worry beads on Etsy. Time for PC to be getting home so we can go to the gym!! Thanks for coming by, sweet friends. I need to make some wellness goals too. I haven’t gone to the gym all week! Well done with your wellness goals, Leslie! When you look back to all our Wellness posts this year, be proud of your achievements. It shows that when we make a list, we’re more likely to complete it. You had me at ‘stress management tips’! Boy could I do with some help with that at the moment. Well done on almost getting to 5s in all your goals – I bet next post you’ll have managed it! You always set such impressive goals for yourself. If I manage to walk on the treadmill 20 minutes a day and read my bible, I’m impressed with myself. You’re looking very trim and toned in your photos so the regime is clearly working! Enjoy a few sweeties, you can get back on the wagon after Thanksgiving!